Awake Organics is an independently owned UK beauty brand focused on health and wellbeing. We create natural skin care with hemp, resins and crystal gemstones. Our working studio is located in the beautiful Northamptonshire countryside. Certified Cruelty Free. Selected from over 500 brands located in the US and Europe, Sea Quartz wins Best Facial Scrub finalist at Indie Beauty Expo’s Best In Show Awards. Awake Organics was the only UK beauty brand in the category. Vegetarian Living, Calm Moment, and (USA) ABC News, Good Morning America. Beauty Sleep Feature (Page 1) (Page 2) by Indie Beauty Founder, Melissa Kimbell. Makeup by Marcio uses Awake Organics to achieve his ultra trendy, signature looks. 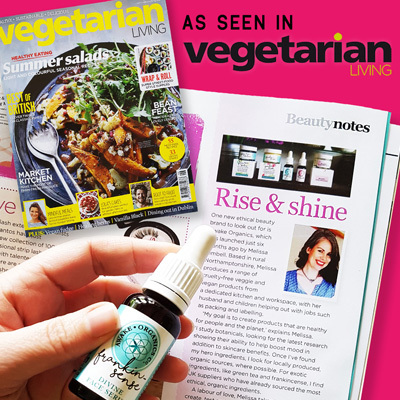 Our vegan face serums make the list of Vegan Food & Living Magazine’s Best Summer Skin Care. Aura Clean Deodorant is named as a natural deodorant that works. Syndicated on several online platforms, including Virgin Media, Expose, Irish Examiner. Awake Organics natural skin care range gets a lovely endorsement from professional Make-up Artist, Phoebe Walters, No Basic Girls Allowed. Awake Organics gets a mention on The Glass magazine, listing the must-see brands at Indie Beauty Expo London. 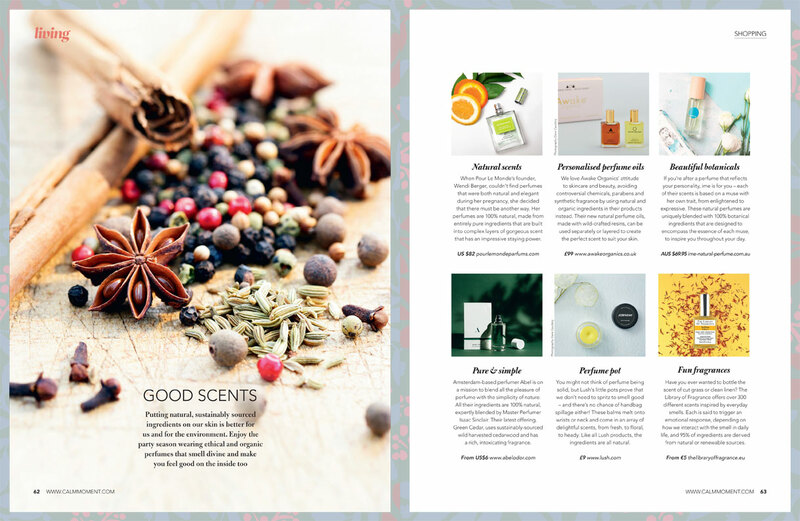 Supernatural Infusions, our latest set of natural perfume oils, is mentioned on Natural Organic Product News. Sea Quartz features as a trending product on Natural Products News. Awake Organics is featured on Refinery 29’s “13 Cool Brands” discovery report. Selected from over 500 brands located in the US and Europe, Sea Quartz is nominated for Best Facial Scrub at Indie Beauty Expo’s 2018 Best In Show Awards. Awake Organics features as a hemp based “Brand We Love” on Wow Beauty. Awake Organics, UK Beauty Brand, features in the number one spot in ELLE’s “Four under-the-radar wellness brands to watch”, specifically mentioning crystal-infused skin care as an up-and-coming trend. Sea Quartz is selected as London beauty buyers choose stand-out products from Indie Beauty Expo 2018. Awake Organics, UK Beauty Brand, features on WGSN as a “Top brand to watch” in their trend report. Awake Organics, UK Beauty Brand, is profiled by Beauty Independent, highlighting consumer-driven ethics and transparency in our supply chain. Our natural perfume oils on Beauty Balm. Frankin-Sense Divine Skin Concentrate wins a Best Night Moisturiser award in the Green Parent Magazines’ 2018 Natural Beauty Bible. Citrus + Hemp Clearing Face Serum is hailed as a hemp oil beauty saviour for adult, blemish-prone skin in In The Moment Magazines’ feature on Hemp Seed Oil Beauty. Citrus + Hemp Clearing Face Serum is featured as a top 10 Affordable Things To Buy on RED Online. Frankin-Sense Divine Skin Concentrate and Awake Organics feature in the “Say No To Plastics” feature in Planet Mindful Magazine. Frankin-Sense Brightening Serum Divine Concentrate impresses the Beauty Editors at Veggie Magazine, appearing in Live Well and featuring as a top pick for smooth, healthy skin. 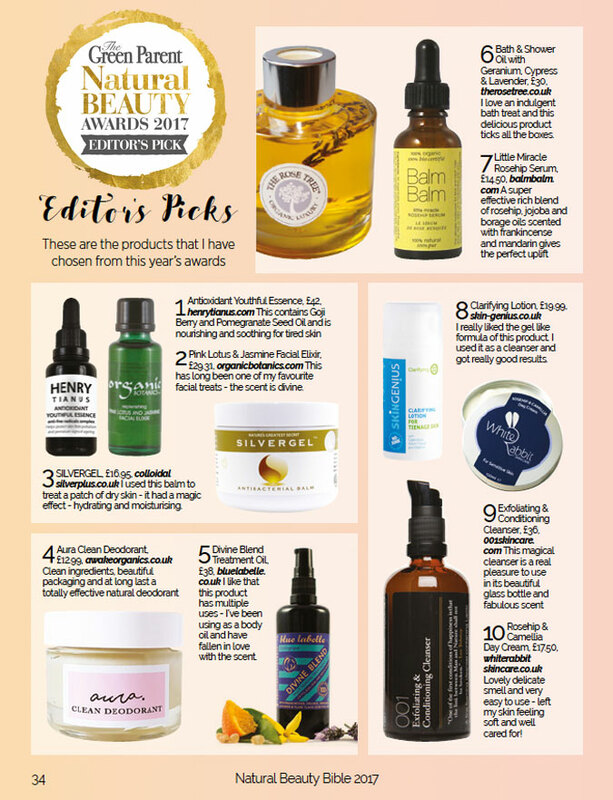 Green Tea + Detox Mask features in Harness Gaia’s Earthy Goodness, Soul & Spirit Magazine, Editor’s Pick. Described as a hydrating, rich skin treat. Melissa Kimbell’s expert advice is quoted as one of six inspirational business women. The Metro UK feature celebrates creativity, drive and the pure grit of Mothers who have started their business since becoming a parent. Aura Clean Deodorant won The Beauty Shortlist 2018, “Best Natural Deodorant” Award. Now in their 7th year, The Beauty Shortlist Awards are well-respected in the beauty industry. Over 600 brands entered from 39 countries, and judging took place over a 6-month period. These awards are completely independent – there’s no public vote, no ads, no sponsors. 100% independent. Tested. Loved. Recommended. 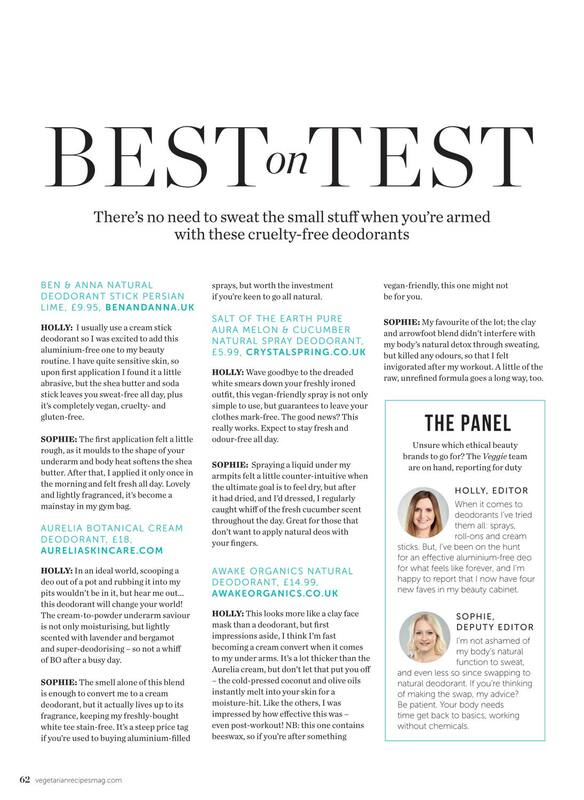 Aura Clean Deodorant is put to the test by Beauty Editors at Veggie Magazine. Read their unbiased review of our top cruelty-free, natural deodorant. Melissa Kimbell is featured as an inspirational female entrepreneur, Ladies Who Launch. Melissa Kimbell is quoted as a expert on “How Sleep Affects Your Skin”, Fashion Fix Daily. Awake Organics is featured as an inspiration female-led start-up, Eyedea Female Millenials Network. 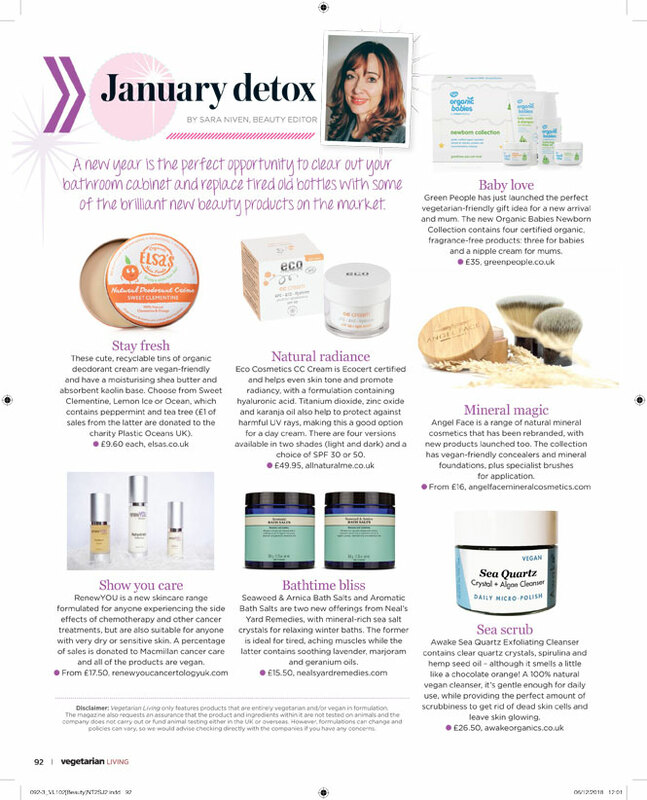 Melissa Kimbell’s expert skin care advice is quoted in Xpose and The Irish Examiner. Aura Clean Deodorant gets an unbiased, 5-Star Review on I The Stylist. Green Tea + Detox Face Mask Features as a healthy lifestyle choice on The Ecological for #WorldCancerDay. Awake Organics, UK Beauty Brand, features in the Top 10 Sustainable Brands to Watch in 2018 by Flor + Cesta. LITTLE THINGS gift set, 100% Made in England, featuring a collaboration between Awake Organics and BuzzBalm is shortlisted by Pebble Magazine in the ‘Ultimate Ethical Christmas Gift Guide’. Our Mini 2-Step Frankincense Nourish + Glow facial hydration system is shortlisted in Vegetarian Living Magazine’s Christmas Gift Guide. Aura Clean Deodorant WINS SILVER in the 2017 Pure Beauty Magazine Awards. Category: Best New Deodorant. Frankin-Sense Divine Skin Concentrate features as a Winter Skin Saviour in Veggie Magazine’s “Veggie Recommends” department. Frankin-Sense Divine Skin Concentrate features as a stress-busting Calming Balm in “6 zen-inducing products to calm stressed skin”, by The Grooming Guru, Balance Magazine, London. Aura Clean Deodorant is shortlisted in the 2017 Pure Beauty Magazine Awards. Frankin-Sense Divine Skin Concentrate features in Seasonal Superheroes. Aura Clean Deodorant wins Editor’s Choice for Best New Deodorant, Green Parent Magazine. Awake Organics features in POPSUGAR as the skincare range that helps reduce anxiety. 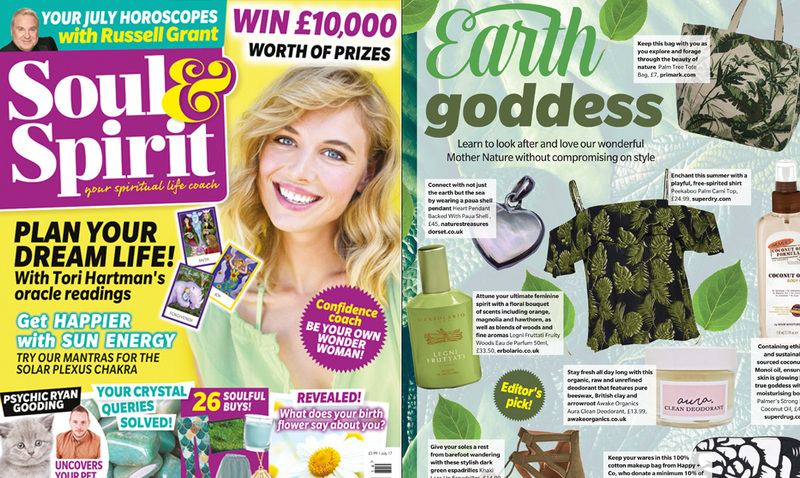 Awake Organics features in the Soul & Spirit magazine Earth Goddess shortlist. Citrus + Hemp Clear Skin Serum features as a Summer Skin Saver. Citrus + Hemp Clear Skin Serum in Nature’s Best, by skincare expert, Charlotte Connoley. Aura Clean Deodorant makes RED’s Top 10 Affordable Summer Splurge Shortlist! (shortlist updated weekly). August, 2017. “Skin is left healthy, glowy and moisturised. The (Frankin-Sense Divine Skin Concentrate) cream has a really beautiful scent and is a real treat and makes moisturising into a lovely ritual. I can honestly say it’s one of my favourite products this year. As well as being a delicious treat for the skin it soothes and calms the senses…” Read More From Beauty Balm. Beauty Queen UK reviews our Aura Clean Deodorant. March, 2017. “I have found the (Aura Clean Deodorant) cream formula really interesting to use. It smells lovely and fresh and it takes a bit of getting to used to when applying it. 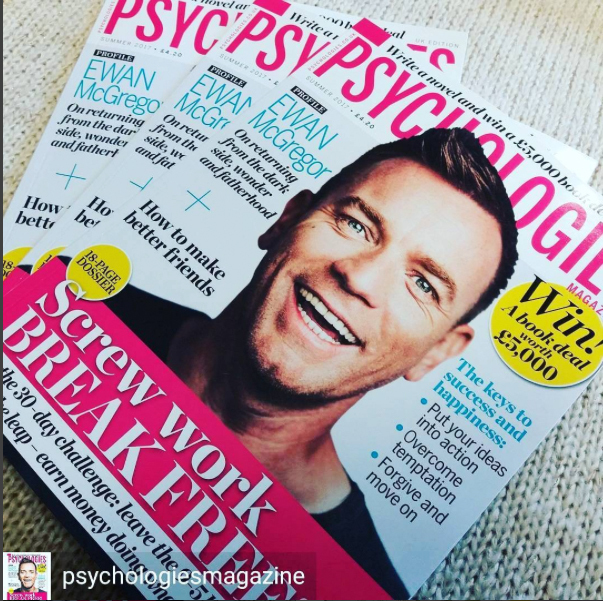 So I am glad I did pick this up…” Read More from Beauty Queen UK. Beauty Balm Reviews our Aura Clean Deodorant in the YOU Beauty Box Shortlist. March, 2017. “I’ve been really impressed with the effectiveness of (Aura Clean Deodorant), hubby loved it too, so will pick up full size. The scent is citrus, floral and herby (lavender, rosemary, lemongrass and peppermint) which is a naturally antibacterial formula…” Read More from Beauty Balm.